The case of “Ilha Brasileira” was raised by Uruguay (officially formulated by a Reserve Note of 1940),complaining about the Borders Complementary Convention between Brazil and Argentina, which took place in December, the 27th of 1927. 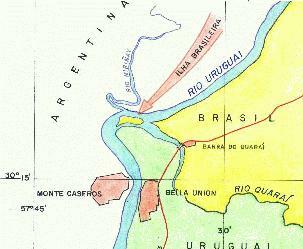 That note shows the Uruguayan government complaining about the agreement made by Brazil and Argentina to set the limit in a small part of the border between the two countries (furthest southeast point of Brazil in Rio Grande do Sul), in that place, in front of the so called "Ilha Brasileira", had not been taken into consideration the Uruguayan interests – which would be a “res inter alias acta”. - The "Ilha Brasileira" is not an island in the estuary of River Quaraí, but it is an island located in the south of this estuary, then River Uruguay. Therefore the island was not demarcated yet. - The main Landmark 13-P, in the extreme south of the island, alleges Uruguay, was constructed by Brazil, in 1862, in a unilateral way. "Los Plenipotenciarios imperiales que cedieron de los límites de 1819, obligándose por ello a contrariar a la población del Rio Grande y a quitarle sus más queridas esperanzas, cedieron también las aguas vertientes del Cuareim y se limitaron a pedirme que les diese una sola estancia - la del Barón de Cerro Largo - tomando el gajo del Cuareim que llaman de la Invernada y la isla de la embocadura de ese río en el Uruguay - isla que es también de propiedad brasilera - para poder establecer allí depósitos de carbón, etc. para la navegación que va a sernos común". As soon as the Treaty was signed, in October of 1851, there were some difficulties for its ratification by the Uruguayan legislative. At first the Treaty intended to give Brazil, beyond the exclusively sovereignty over the "Laguna Merín", also the possibility to occupy the edges of the Uruguayan Rivers (Cebollati and Taquary) in the East Coast of the Lagoon. The"Declaration" was necessary, Reverses Notes of December 3rd, 1851, on the genuine intelligence of the 2nd paragraph of III and IV articles of the 1851 Treaty. This document says: "Pelo parágrafo 2º do artigo III do enunciado Tratado se declara que pertencem ao Brasil a ilha ou ilhas que se encontram na embocadura do rio Quaraí, no Uruguai. ." In addition to this" Ao fazer-se esta declaração ficou subentendido, de acordo com todos os princípios admitidos nas estipulações relativas à navegação das águas comuns, que não se servirá da ilha ou ilhas da embocadura do Quaraí para embaraçar ou impedir a livre navegação dos ribeirinhos." There cannot be any doubt about which island the negotiators in charge of the Treaty referred in these three historical documents of the 19th century. Let’s see how the works of landmark of the border were made in fulfillment with what was foreseen in the Treaty. The Mixed Commission works started in 1853 in the Atlantic side in the far east, close to arroyo Chuy, and it had been extended up to 1857/1858. - April 28, 1856- the 3rd minute According to the limit in the Arroio Invernada´s region..
- April 1st and 6th, 1857 - 4th minute. It´s about the region of Retas do Aceguá and São Luiz. . The third minute was written " ... no Arroio Invernada, por cujas águas continuará a linha até a sua foz no rio Quarai, ... Que, em conformidade com o mesmo Tratado, a linha seguirá pelas águas do Quarai até sua foz no Urugugai ..."
By the abundant documentation (letters and reports) left by the Baron of Caçapava (Brazilian Deputy in charge of Demarcation), describing all the problems found, divergences and agreements made to accomplish what was established in the Treaty, we verify that the ones in charge of demarcations used to consider in that occasion, the problem, was pratically solved, once that from that point on (both Arroio Invernada and its estuary in Quaraí were defined), the limit line would be restricted to the course of River Quaraí until its estuary, therefore, there could not be any divergences anymore. The necessity of a 4th minute, occured because the two lines had to be arranged in the region of Aceguá and São Luiz. The work of building border landmarks followed normally, carried by the Brazilian team that in 1855 has finished settling the landmarks in the region of Chuy and in 1857 the landmarks of the region of Aceguá and São Luiz. The incidents occured then were taken to the Uruguayan authority. To make the work of implementation of border landmarkers in the region easier, many documents were forwarded by Oriental Republic of Uruguay government.These documents instructed the political head chief to the departments involved, to do not oppose the works. The governments made an agreement "Acordo de 30 de julho de 1858" which says "Das explicações dadas ao governo pelo coronel de engenheiros D. José Maria Reyes, comissario da Republica para a demarcação ... resulta: ... Que assentado e demarcado pelas duas comissões ... continuou o comissario oriental a demarcação da linha até sua terminação no Uruguai, ... foi solicitado pelo comissario do Brasil para a designação dos pontos em que deveriam colocar-se os marcos na linha reta entre S.Luiz e Aceguá, de conformidade com a demarcação praticada pelas comissões dos dois Estados. Sendo esta ultima operação meramente secundaria e subordinada a presente demarcação dos comissarios, o governo considera que ficaram perfeitamente garantidos o acerto e a exatidão da operação pelos conhecimentos científicos dos respectivos auxiliares de ambas as comissões, associadas pela confiança de seus governos a uma operação de alta transcendência para os dois países visinhos e aliados, e tão honrosa para os encarregados de pratica-la." In the beginning of 1860 the Uruguyan Comission, by decree, was ended. The landmarks settlement did not stop, and around that time the construction of the landmarks in Sant´Ana do Livramento was over. The Brazilian delegation chief head, in January, 1861, communicated that was about to finish the construction of the landmarks, until the end of the year. In fact, in January, 1862, the construction of the last border landmark in the edge of the island of Barra do Quaraí was communicated (Marco 13-P). The following years were very confused - Venancio Flores Revolution, the burning of the Treaties by the government "blanco" in December, 1864 (later restored in February, 1865) - taken place then the Triple Alliance, War: Brazil, Argentina and Uruguay against Paraguai. In 1916 Uruguay and Argentina signed a Treaty about the demarcation of the islands of Uruguay River. The limit line used to go through the “talweg” of this river, which was in Uruguay disfavor (in the south side the “talweg” flows by its coast, causing the lost of sovereignty of the traditionally Uruguayan islands); because of this the Treaty was not ratified. Art. 2º - En virtud de lo dispuesto en el articulo 1º se declaran pertenecientes a la República Oriental del Uruguay las islas ... " without any references about "Ilha Brasileira" "pertenecientes a la República Argentina, las islas denominadas Correntina (2) ..."
As we see until the 30´s there were no border line problems between Brazil and Uruguay. The situation of Lagoa Mirim had been already set (in 1909) by Barão do Rio Branco, that in an unilateral Brazilian act, abdicated its exclusively sovereignty of its waters to bring the limit to a broken line in the middle of this lagoon (not through the occidental coast as foreseen in the 1851 Treaty). By that time in Uruguay began a movement led by certain history geographers who believed Brazil could be more condescend and liberate other areas to be incorporated to Uruguay. This kind of reasoning may had been part of the difficulties and questionings found by Barão do Rio Branco in Brazil, when he began political maneuvers at the Parliament, to the approval of the Treaty of 1909 about Lagoa Mirim. The thirties is the beginning of Uruguay questionings to the “ Rincão de Artiga”, which nowadays is called "Masoller / Vila Albornoz", case, that were followed by “ Ilha Brasileira” case and were transformed in two false “border problems” found by some Uruguayan to difficult the relation between both countries. As presented initially the "Ilha Brasileira" region is close to the border between Brazil and Argentina. The small part of the border heading north, going up Uruguay River, it had been set in 1898. They still had to set the limits by Uruguay River by Ilha Brasileira. Therefore a Complementary Limit Convention was signed in December 27, 1927, declaring in its 3rd article "... A linha divisória entre o Brasil e a República Argentina, no rio Uruguai, começa na linha normal entre as duas margens do mesmo rio, e que passa um pouco águas abaixo da ponta sudoeste da Ilha brasileira do rio Quaraí, também chamada Ilha Brasileira, segue, subindo o rio, pelo canal navegavel deste, entre a margem direita, ou argentina, e a margem ocidental e setentrional da ilha do Quaraí ou Brasileira, passando em frente da boca do rio Quaraí, que separa o Brasil da República Oriental do Uruguai, e prosseguindo do mesmo modo pelo rio Uruguai, vai encontrar a linha que une os dois marcos inaugurados em 4 de abril de 1901, um brasileiro na barra do Quaraí, outro argentino, na margem direita do Uruguai." In 1940 (13 years later) Uruguay presented a Reserve Note (September 8, 1940), affirming that the case had been made directly between Brazil and Argentina without taking into consideration Uruguay’s interests. In 1961 Uruguay and Argentina finally agreed to solve the problem about the limit in Uruguay River’s Borders, they decided to adopt a mixed character line which contemplates the particularities of this border where the limit line follows the river in places different from the islands localization and where you find Uruguayan islands in Argentinean waters. However in this part of the river, there aren’t great particularities for our study case. This Treaty establishes in its 1º article: "El límite entre la República Argentina y la República Oriental del Uruguay en el Río Uruguay, desde una línea aproximadamente normal a las dos márgenes del Río que pase por las proximidades de la Punta sudoeste de la Isla Brasillera hasta ... estará fijado en la siguinte forma: A) Desde la línea anteriormente mencionada que passa por las proximidades de la punta sudoeste de la isla Brasilera hasta ... el límite seguirá la línea de media del cauce actual del Río. Esta línea hará las inflexiones necesarias para dejar bajo jurisdicción uruguaya ... y bajo jurisdicción argentina las seguintes islas e islotes, islote Corentino, isla Corentino ..."
When this Treaty was subscribed, Uruguay formulated the following reserve: "En el acto de firmar, como plenipotenciario de la Republica el Tratado de Límites en el Río Uruguay, ... debo, por expresa instrucción de mi Gobierno reiterar del modo mas solemne - como así lo hago - la reserva ya formulada en 1940 de los derechos que corresponden a mi país en la zona del río Uruguay deslindada entre la República Argentina y los Estados Unidos del Brasil, por la Convención Complementaria de Límites de 27 de deciembre de 1927". Since then, Uruguay had been presenting this issue through many documents and articles in newspapers around the country, that should be solved with Brazil. The Uruguayan government established a decree in 1974 determining that the official maps would start to show the island located in the estuary of Quaraí as “contested limit”. -Uruguay's note of August 17, 1988 (this note came followed by two others with the same date; one about a supposed demarcation error in part of the border called Rincão de Artigas, and the other note is about the exploitation of the Quaraí River’s waters.). -Brasilian note number 270 of december 4th, 1989 , Brazil´s reply, requesting some aditional information about the prior note. -Uruguay’s note number 366 of October 22, 1990, , Uruguay clarifies that "el tramo contiguo a la desembocadura del rio Quaraim ... una zona de contacto ... que nunca ha sido delimitada" pois que o Tratado de 1851 "... estabeleció los límites entre ambos paises, exclusivamente hasta la desembocadura del Rio Quaraim en el Rio Uruguay". And it adds that "en la negociación que se deberá llevar a cabo ... se requiere establecer, sobre bases técnicas el lugar especiRfico en que se encuentra la desembocadura ... efectuandose los correspondientes estudios hidrológicos ..." also recalls that the fluvial course of the Quarai River is "álveo" and as agreed in the Legal Statute (of 1933) the jurisdiction of each stream will hit the opposing edge. -Uruguay’s note number 259 of July 28, 19977, it was made because they didn´t receive a response for the note number 366 of October of 1990, it directs the attention to the lack of definition of the contact point between the respective jurisdiction of the three ribeirinhos, Brazil, Argentina and Uruguay. This is the official situation between both countries. TILL NOW, BRAZIL HAVE NOT ANSWED THIS 3ª NOTE. 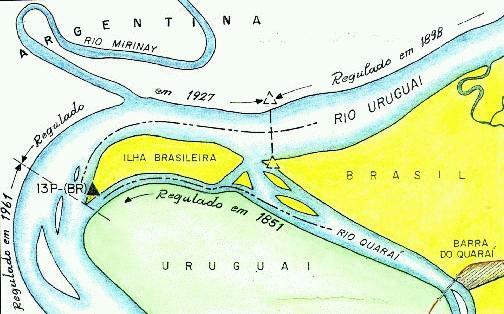 IT COULD BE ACCEPTED TO DISCUS WATERS AT THE REGION, SINCE NOT BE DISCUSED THE POSSESSION OF "ISLA BRASILEIRA" (LOCATED AT THE RIVER URUGUAY, INFRONT OF THE ESTUARY OF THE SO CALLED QUARAIM RIVER, BUT BELONGED TO BRAZIL, FOR ITS NAME AND FOR IT IS EXPRESSLY CITED IN THE TREATY OF 1851). This island had never been used as a coal deposit, as it was foretold in the 19th century, neither to put an embargo to the navigation in this river. Casually used by fishermen and smugglers in the past, the island had been occupied in the last 30 to 40 years by a Brazilian man, José Jorge Daniel and his relatives, whom kept their small house made by wood (See the picture) and a modest plantation in the few areas that remain dry in the flood season of Uruguay River.The rest of the island is covered with dense forest and floods. The “tri partite” point: Brazil/Uruguay/Argentina would be the point “A”. From this point to south, in the direction “AB”, there are Uruguayan and Argentinean waters. From point "A" to the part of Uruguay River, in direction to "C" and "D" there are Brazilian and Argentinean waters. The waters located by south of "Ilha Brsileira", as established in the “Estatuto Jurídico-1933” in its article XXI, are in “álveo” regime, which means community of waters, where the jurisdiction of each streams goes until the opposing edge, but without reaching the coast. The issue presented by Uruguay is unacceptable once the adjudication is questionable - the subject was already established in the 1851 Treaty. What there is to be studied, is the exact establishment of the point "tri-partite" between Brasil, Uruguay and Argentina, which will have to be done by taking into reference the exact coordinates of the Marco 13-P establishing a distance and an azimuth until the established point. 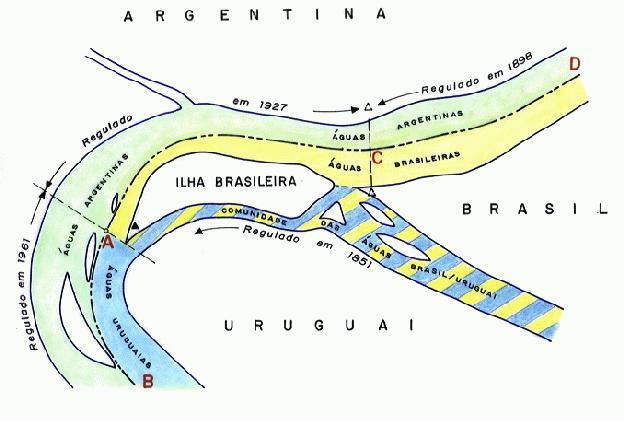 The difficulty presented to find this point is summarized in the detail referred to the regime of border established in the Treaty of 1961 between Argentina and Uruguay that is supposed to follow the limit "by the middle line of estuary river" meanwhile the Treaty of 1927 between Brazil and Argentina says the line follows by the "middle of navigable canal"
This subject will be able to be clarified conveniently by the friendly competition of the three contries as long as they are interested in solve the problem definitely. About the possibility of Brazil yield this island to Uruguay is an impossible subject to achieve , therefore it would cause a change in 1851 Treaty (similarly to the one effected in 1909), what we simply don´t think would be possible along the brazilian parliament. So we hope that Uruguay which had the initiative to raise this question unilaterally, someday come to correct its position cancelling the Decree of 1974, and to be able to forget this small case that is an inconvenient to the relation of both countries. * - This work represents the author´s thought and a result of his researches and study about the subject. See the other case raised by Uruguay - "Masoller / Vila Albornoz" . 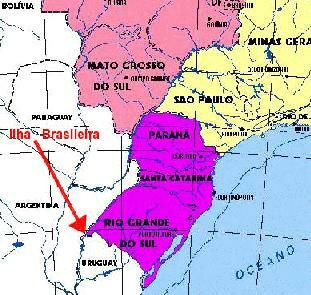 - More information about BORDERS AND LIMITS OF BRAZIL can be found at the following website: http://www.info.lncc.br/.